The Clippers aren’t exactly the creme de la creme of the NBA, but Rasual Butler’s efficiency per 48 minutes is 339th in the league. He’s playing just above 30 minutes per night, scoring 9.7 points, grabbing 3.4 rebounds and dishing 1.6 assists. He’s also shooting 37% from the field, really horrible, lower than his very unimpressive career number of 40.2%. Like we said, the Clippers aren’t exactly bolstered with quality players, but Butler seems to be a bit lucky to say the least to be getting so many minutes a night. Al Thornton, who usually comes off the bench, seems like a better fit for Butler, despite being more of a PF than a SF like Butler. It’s not on Alston. This team (or something that resembles an NBA team) is 0-15, going for the record. Alston wasn’t brought to be a starter, Devin Harris was suppose to be the guy leading the new Vince Carter-less Nets, having a fantastic 2008-2009 season. But he got injured, and since his return, he’s been coming off the bench while Alston still opens at point. He’s not that bad, scoring 10.4 points with 4.8 assists, but his shooting (34.6% from the field) and not so brick-wall like defensive skills make him one of the worst starting point guards in the league. Alston is an OK player, he had a decent run with the Magic last season and a respectable NBA career so far, but this guy shouldn’t be playing almost 35 minutes a night. Another member of the embarrassing 2009-2010 New Jersey Nets. 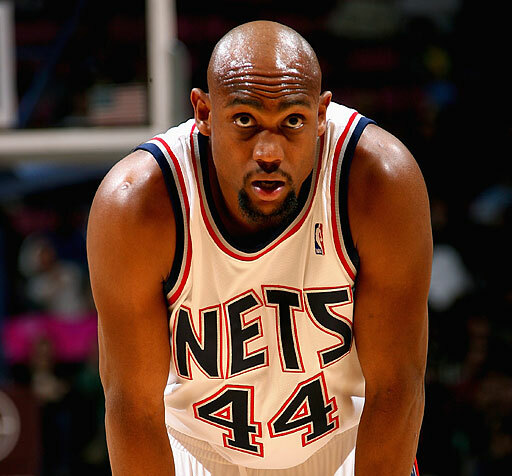 Hassell for some reason has been a starter for most of his career in the NBA (9th season), but he’s never finished with a double figure scoring average. This season is no different, and in 36.1 minutes a night, Hassell is producing 8.9 points per game and 5.3 rebounds. The rebounding part ain’t bad for a 6-5 guard-forward, but he’s there for scoring, and like for most of his career, it’s not there. He was never a good three point shooter, but he’s shot only twice from outside this season, making him a non-threat from the outside, making him a very limited and inefficient outside player (350th in the league in efficiency per 48 minutes). The Nets have got real gems starting for them. Another point guard, this time from the other side of the river. Duhon is in his second season as a Knick, and like all Knicks this season, their sophomore year under D’Antoni, is disappointing. He’s playing 34 minutes a night as the New York’s starting point guard, scoring 6.4 points, dishing out 5.9 assists per game, both down from last season’s 11.1 points and 7.2 assists. A point guard under D’Antoni should flourish, but I guess not everybody is Steve Nash, and the Knicks are definitely not the Suns. Duhon most horrendous stat is his shooting, with an awful 24.1% from the field and 19% from the outside. As probably the most important player in the Knicks’ playing system right now, Duhon is seriously failing at his job. Mickael Pietrus is a fantastic athlete and an awesome dunker. He’s a very good defender and would be classified under “energy guy type of player” or whatever you’d like to call it. That’s the problem with this kind of players – they’re streaky, and they turn to produce cold streaks as often as they do hot streaks when their playing time surpasses the 20-24 minutes a night number. Pietrus had a successful 2009 playoffs showing, helping the Orlando Magic to their first NBA Finals appearance since 1995. This season, also due to Vince Carter being sidelined for a while, he’s been getting more playing time, 30 minutes a night, starting 9 out of 14 games. The numbers? not better than last year, when he played 5 minutes less a night. 9.6 points (9.4 last season) and 2.9 rebounds (3.3 last season). His shooting? Below 40%, for the first time in his career. He does give you defense, with 1.1 steals per game but he turns the ball over more than he assists (1.14 to his 0.6 assists). Verdict? A very good off the bench guy who’ll give you defense and some team and crowd pumping dunks, but a mediocre starter at best.